Yad Vashem has uploaded footage of the entire Eichmann trial to YouTube, 50 years after the landmark trial. The Yad Vashem Holocaust Memorial project has marked the passage of 50 years since the trial of Adolf Eichmann by uploading footage of the entire trial Eichmann, one of the major planners of the Holocaust genocide, was put on trial in Israel in 1961, after having been captured by Israeli agents in Argentina. He was found guilty, and was put to death in 1962. The footage “gives a new generation the opportunity to view one of the most significant turning points in humanity's attempt to grapple with the Holocaust,” a Yad Vashem spokesman explained. Yad Vashem has previously posted Holocaust victims' names online, followed by a collection of photographs from the Holocaust, and a YouTube channel explaining the Holocaust in Farsi. The organization ultimately hopes to put all of its Holocaust documents online. 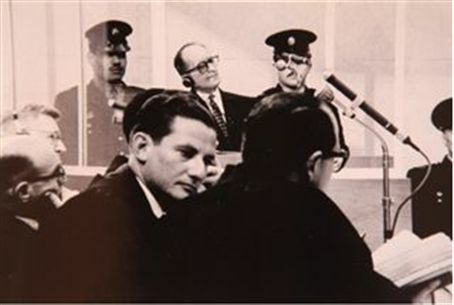 The Eichmann trial was originally conducted in Yiddish, German, and Hebrew, but footage has been dubbed into English as well. The trial channel includes 200 hours of footage and a compilation of testimonies. In a second project commemorating the trial, Yad Vashem has created a video titled A Living Record. The video provides insight into the trial from three participants: Gabriel Bach, who argued for the prosecution, investigative officer Mickey Gilad, and witness Yisrael Gutman.